You’re wondering where this is going, aren’t you? Reminder! There is only one week left to “Fabric8“. 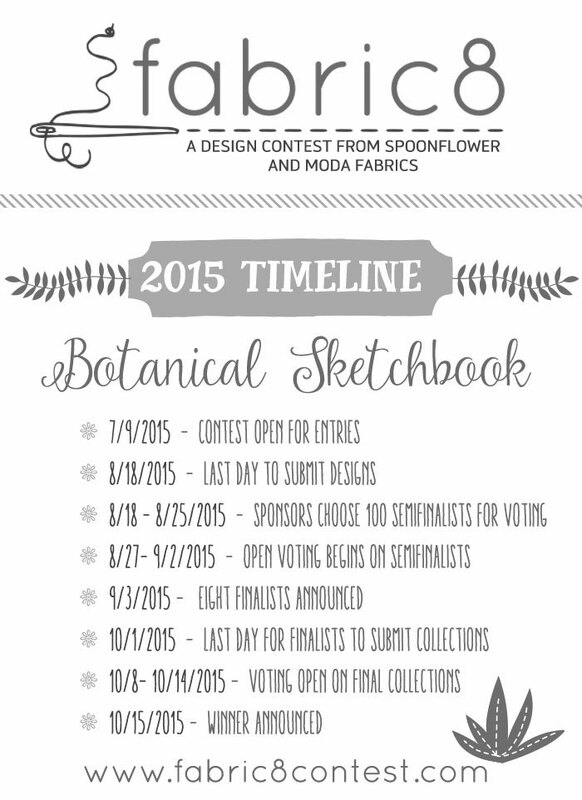 The deadline for submitting designs is next Monday – August 18th. Everything you need to know to enter can be found here. Spoonflower. 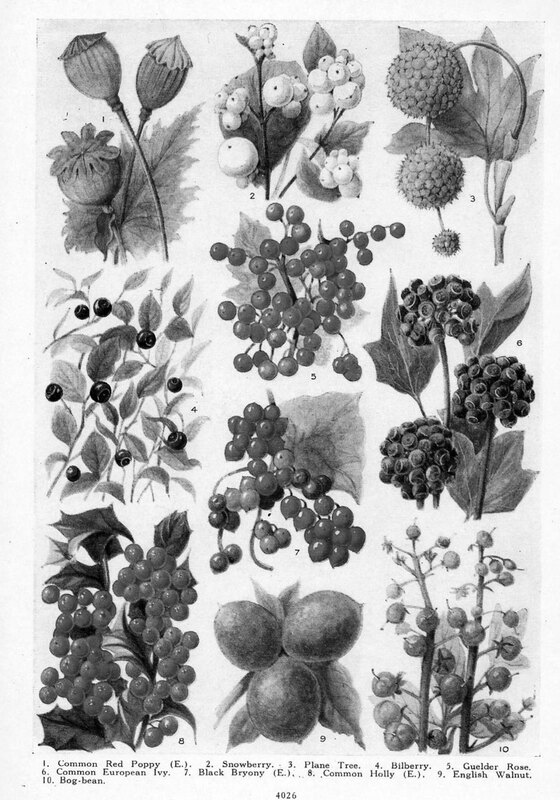 Moda Fabrics. Your name on the selvage of a Moda collection. If you think you’d like that, this is your first test with deadlines. I might be having a little fun with filters on images. True story. But are you sensing a theme here? Modern Background – Paper. By Brigitte Heitland for Zen Chic. Back to this particular Paper… what I love about this collection is that they’re “basics”. 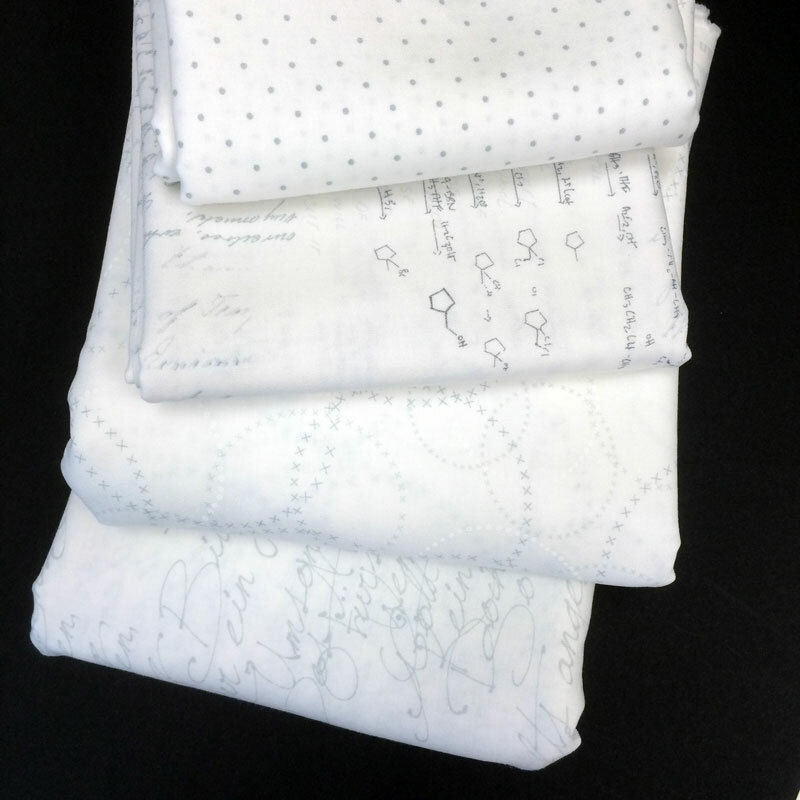 That means the fabrics are highly stash-able – they’re the kind of fabric that I will use these over and over again. Oh wait… I already have! I used several Paper prints for the house quilt (Village – coming soon), a few were mixed into Prairie Prom, and I used one of the prints for the background triangles in Pink Lemonade Starlight. 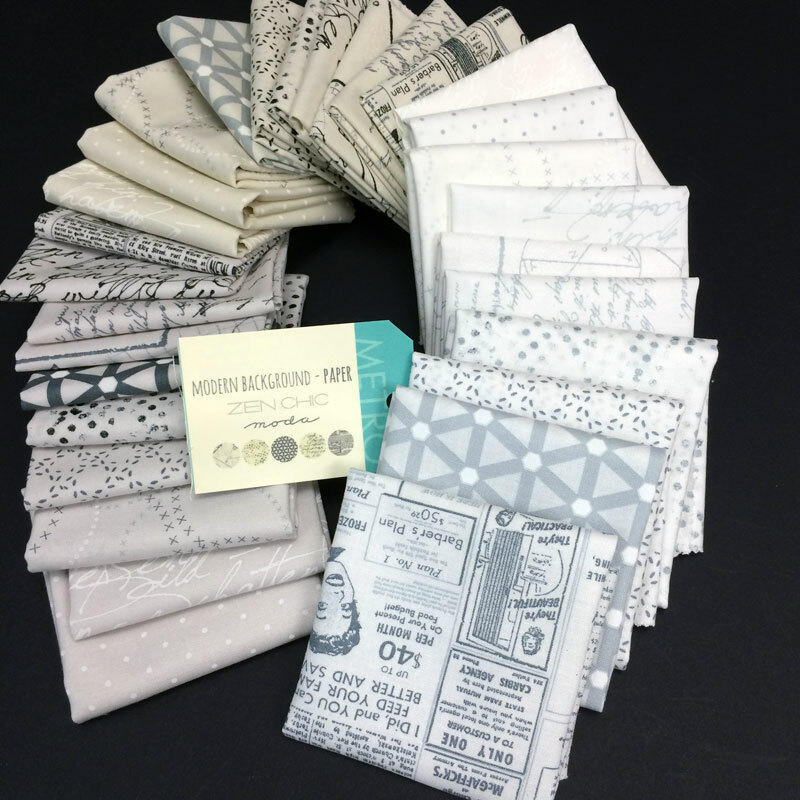 While I love them all and will probably get fat quarters or half-yards of most of them, there are a several pieces that I’ll get more of – probably lots more of. I’d get more of everything in the collection but my apartment isn’t that big and, truth be told, I know which pieces I’ll use a lot and which ones I’ll only use a little bit of. These are my favorites – the four I’ll be “stashing”. From top to bottom: Silver White Polka Dots – 1588 13. Silver White Text & Geometry 1581 11. Silver White Circles 1584 11. Silver White Script 1580 11. I think that’s the hardest thing to learn as a quilter – what to buy and how much to buy. It took me many years to realize that there were fabrics that, no matter how much I loved them, I was never going to need more than a fat quarter or half-yard. I wish there was a book to read or a chart to consult but there isn’t any easy one-size-fits-all answer. Anybody who tells you otherwise is… well, not realistic. Our tastes change, and it takes some self-examination about the kinds of quilts you make to determine what YOU need to be stashing. It comes down to one thing – what kinds of quilt you make. For me, my “job” requires that I use new, available fabrics. The sewing I do for myself – for fun – means that I’m probably mixing backgrounds, some “old” and some new. I’ve always done that, only the tone and style of the fabric has changed. For backgrounds that I really love, I usually get at least 4 yards. For these, I’ll probably get 5 or 6 yards. Maybe a bolt. (Especially of the polka dots.) While I love the tone-on-tone backgrounds in the collection, and those that have more print and contrast to them, I’ve learned that I like them best in other people’s quilts. They’re just not “me” – even when I’ve tried to do something like quilts I love. I’ll mix them in with background prints like these, but in proportionately smaller amounts that the main backgrounds. Because there are a few things I can’t show you just yet – soon! – this next part is a “teaser”. 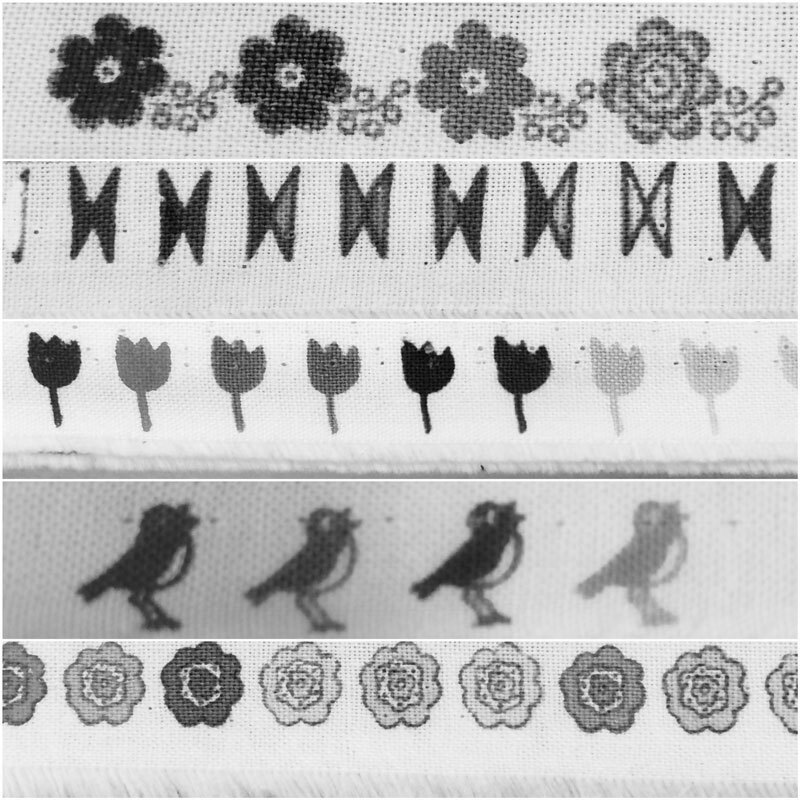 These are some of the selvages for upcoming collections – done in black-and-white. My “shades of gray”. 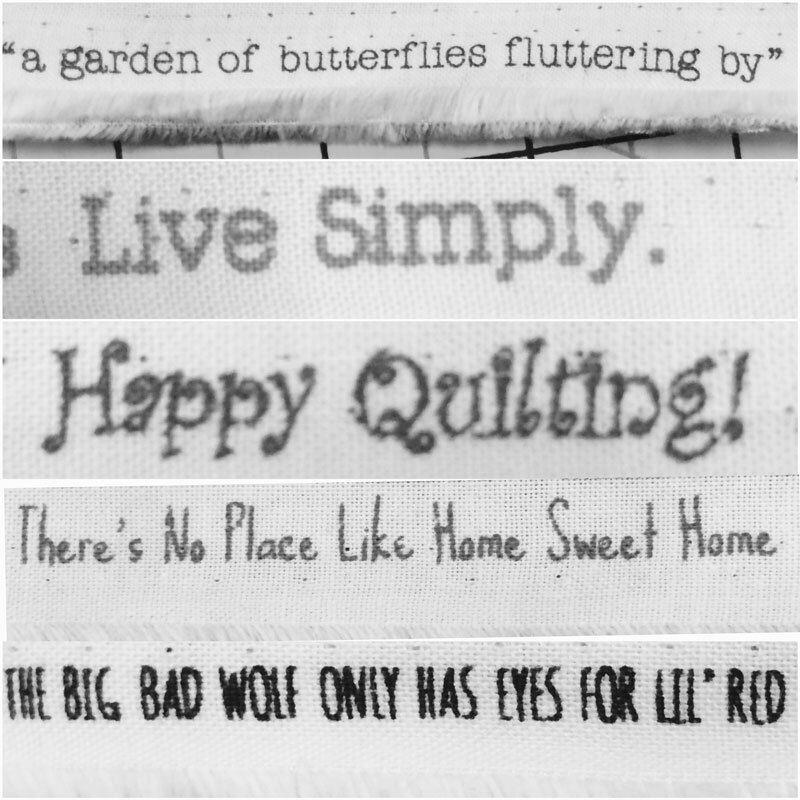 I love the new “dots” but my favorite addition are the quotations and captions starting to appear on the selvages. I’m a word-girl – another big surprise, right? – but so are most of the designers of the fabric collections. They’re creative types, and for some odd reason, it seems like most creative-types also love quotes and simple messages. With selvages like this, I just might wind up making a selvage quilt after all. That’s it for today. I’m off to proof some patterns, make notes for a few new ones and do some sewing. But not necessarily in that order… I hope. Previous Previous post: I love fabric! Next Next post: How do Moda Designers’ Gardens Grow? What fun! Selvages are becoming so creative and interesting! I think that Modern Background Paper is going to fly off the shelves – it certainly is stashable! I just love Zen Chic’s fabic lines. One of your best informational, inspirational postings. Thank you Carrie. As a side note….what does AB Bundle stand for referring to fat quarter bundle? Have a great week. Absolutely Beautiful! Absolutely Buy-able! Adorably Bundled? Oh I have been waiting for this line! Thanks for the heads up. Took me a long time to realize I needed lots of yardage of my favorites and a FQ would do of others. And the first time a bolt arrived…ha, ha my dh couldn’t believe you could buy fabric in bolts as a consumer! I love the dots and circles (top and third down in your favourites pile) and would like a few (3?!) metres of each – hope someone in the UK is going to be stocking them! I’ll probably only be able to get 0.5m but I’ll be sure to eke it out! That’s always the big question isn’t it? How much of this fabric do I need (and then there’s how much do I want? But that’s another one;-) Normally I’m good with a FQ unless it’s for background then I’m normally good with 2 meters. Oh, and then there’s the fabric I MUST HAVE! I mean there was this Heather Ross OPP bundle … how could I say no? Or the one time one of my favorite persons sold a Strawberry Fields FQ (I still have it)? There’s fabric and then there’s FABRIC. And I hope one of the selvages is from the new B&C collection. I have a standard ‘buy 3 yards’ of what I call focal fabric. Background types I vary from 2 to 4 yards. Then there’s the gazillion fat quarters, jelly rolls, and layers cakes where I can’t settle on just one fabric from a whole line!